Where is your Palm today? 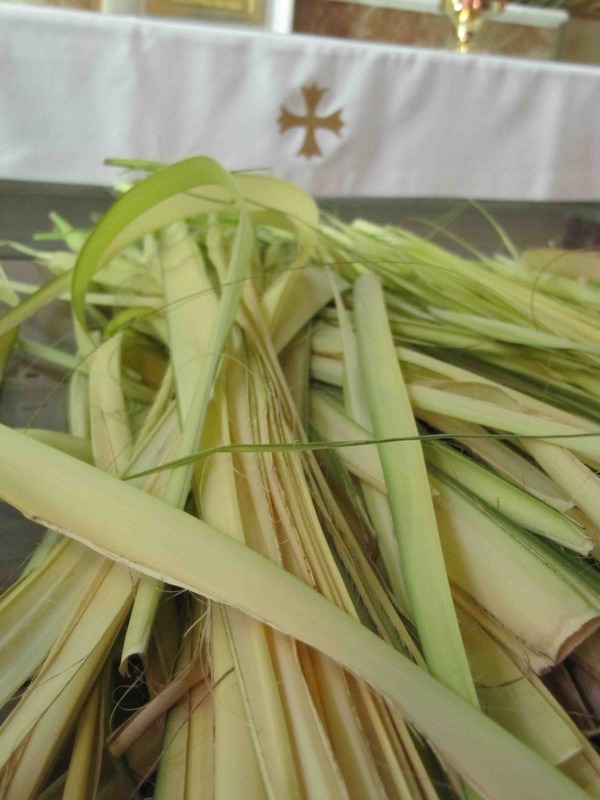 You took some palm home with you Palm Sunday? Where is it today? Following Jesus isn’t a one day thing, it’s a lifelong journey. Stay at his side day by day. To enter Jerusalem, he sat on a humble beast of burden, the donkey, who carried the burdens of the poor. Follow him on his way and make it your way too. 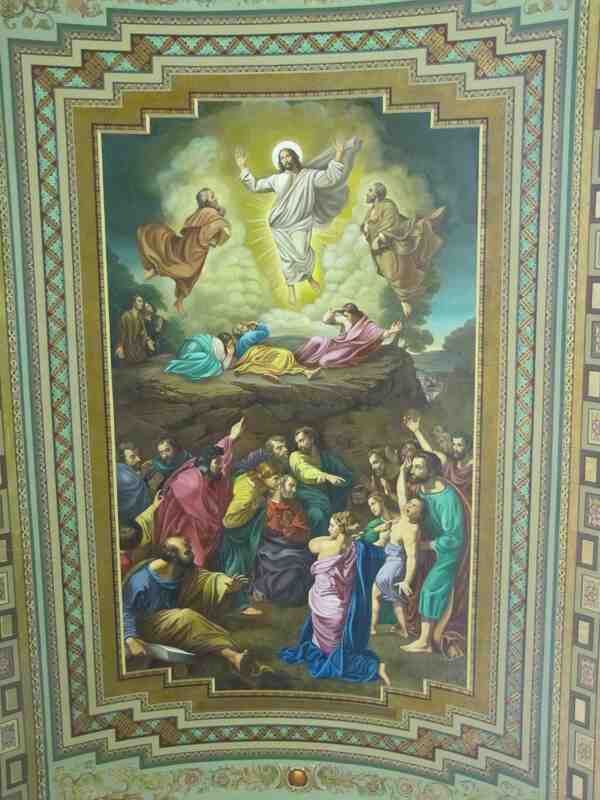 This entry was posted in Passionists, Religion and tagged Jesus Christ, New Brunswick, NJ, Palm Sunday, parish mission, St. Mary of Mount Virgin on April 14, 2014 by vhoagland. 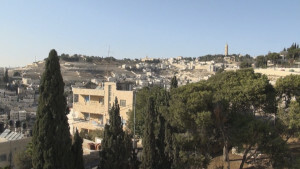 From the roof of the Passionist house in Bethany you can see the eastern slopes of the Mount of Olives looming ahead; the road winds over the crest of the mount down the other side past the Garden of Gethsemani and into Jerusalem. We walked part of the road last week. This entry was posted in Religion on April 13, 2014 by vhoagland. Matthew’s story of the passion of Jesus (Matthew 26-27) is the first of the four gospels read in Holy Week. Why four? Because this story can’t be expressed easily; each of the evangelists has something to say. It’s a story that begins when Jesus rises from the dead. Appearing to his disciples at Jerusalem that day “Jesus came and stood among them and said, ‘Peace be with you.’ When he had said this, he showed them his hands and his side.” ( John 20,19-21 ) To the disciples on the way to Emmaus that same day, Jesus said: “‘Was it not necessary that the Christ should suffer these things and enter into his glory?’ And beginning with Moses and all the prophets, he interpreted to them in all the scriptures the things concerning himself.” (Luke 24,26-27) The gospel narratives grew from these appearances of the Risen Christ and the scriptures he interpreted. The Passion of Jesus is an Easter story that brings hope. He did not hide his wounds; he showed them to his disciples. He doesn’t dismiss his sufferings and death as an embarrassing setback; the power of God appeared in them. As Jesus revealed his experience, he made the hearts of his followers burn with rejoicing. As the story is told to us, we respond with a simple response of love. La historia de Mateo sobre la Pasión de Jesús (Mateo 26-27) es el primero de los cuatro Evangelios que se leen en la Semana Santa. ¿Por qué cuatro? Es que este relato no se puede expresar facilmente; cada uno de los evangelistas tiene algo que decir. Este relato es contado inicialmente por Jesús Cristo después de resucitar de entre los muertos. Apareciendocele a sus discípulos en Jerusalén ese día, “Jesús entró y, poniéndose en medio de ellos les dijo, ‘Paz a ustedes.’ Cuando él había dicho esto, les mostró las manos y su costado.” (Juán 20,19-21) A los discípulos en el camino a Emaús ese mismo día Jesús les dijo, ” ‘¿A caso no tenía que sufrir el Mesías estas cosas antes de ser glorificado?’ Y comenzando con Moisés y todos los profetas él se puso a explicarles todos los pasajes de las escrituras que hablaban de él.” (Lucas 24,26-27) Estos narrativos del Evangelio provinieron de las apariciones del Cristo Resucitado y las escrituras que él interpretó para ellos. La Pasión de Jesús es un relato de Pascua que trae esperanza. Él no escondió sus heridas; él se las enseñó a sus discípulos. Él no descarta sus sufrimientos y muerte como si solo hayan sido unas molestosas contrariedades; el poder de Diós se manifestó por ellas. Cuando Jesús revelaba su experiencia, él causaba que los corazones de sus seguidores ardieran con regocijo. Cuando nosotros escuchamos este relato, respondemos con la sencilla respuesta del amor. Qué la Pasión de Cristo siga siempre en nuestros corazones! haiwezi kuelezewa kwa urahisi; kila mwinjili ana jambo la kusema. Ni hadithi iliyoanza baada ya Yesu kufufuka kutoka katika wafu. Mfufuka na maandiko matakatifu aliyoyaeleza/aliyoyafafanua. hadithi hii iliyvoelezwa kwetu, tunaitikia na mwitiko rahisi wa upendo. Basi mateso ya Kristo na yawe daima ndani ya mioyo yetu. This entry was posted in Religion and tagged Holy Week, Matthew's gospel, Palm Sunday, The Passion according to Matthew, the Passion of Christ on April 12, 2014 by vhoagland. We call this week “Holy Week,” because it’s the week the church follows Jesus closely to his death and resurrection. Today we go with him into Jerusalem where people clapped their hands and shouted out his name and sang his praises; a few days afterwards they put him to death by crucifixion. Jesus Christ came upon earth, not just to teach us but through his death to take away the death we all face, and through his resurrection to give us the promise of life, eternal life. The first few days of Holy Week, Monday, Tuesday and Wednesday, the gospel readings follow Jesus as he prepares to die. He stays away from the temple area in Jerusalem where he spoke previously to mostly hostile listeners. In these first days of Holy Week he looks for the company of “his own,” his friends in Bethany and the disciples who have followed him up from Galilee. On Thursday of Holy Week Jesus goes with his disciples into the city, to an upper room near the temple, and at that meal he offers himself to his Father as a new sacrifice for the life of the world. On Good Friday he faces death on a cross in a drama that has never been equaled and has hardly been understood. Holy Saturday is a day when the world is silent. Like the disciples of Jesus before us, we wait with the little faith and hope we have for the light that will come from the empty tomb. Easter Sunday Jesus Christ rises from the dead. This week at Immaculate Conception Parish in Melbourne Beach, Florida, I’m preaching a mission for the first three days of Holy Week. My reflections will be mostly from the Gospel of Mark, but they will include the other scriptures that speak of the mysteries of Holy Week. On Monday, I’ll speak about the supper at Bethany and the Last Supper in Jerusalem. On Tuesday I’ll speak about the Passion narrative of Mark from the arrest of Jesus in the Garden to his burial in the tomb. On Wednesday, I’ll speak about his Resurrection from the dead as the scriptures describe it. This entry was posted in Religion and tagged Florida, Holy Week, Immaculate Conception Parish, Melbourne Beach, mission, Palm Sunday on April 12, 2014 by vhoagland. The wonderful story of the death and resurrection of Lazarus (John 11,1-45) leads us to the mystery of Jesus’ death and resurrection. Lazarus belongs to an influential family that welcomed Jesus to their home in Bethany, a village about two miles from Jerusalem. Martha and Mary were his sisters. Jesus stayed with them when he visited the Holy City. 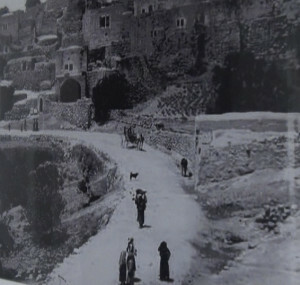 When Lazarus died some days before the Passover, Jesus had left Jerusalem because of threats to his life and was staying in the safety of the Transjordan, the region where John the Baptist had baptized. Notified of his friend’s death, Jesus returned to Bethany, unconcerned for himself. Death in its many forms was what Jesus came to take away, our gospel wants us to understand, and the dead Lazarus was a sign of what he wishes to do for all humanity. Lazarus was his friend, but Jesus, the Word made flesh, befriends the whole human race. In the stirring conclusion of today’s gospel, Jesus calls the dead Lazarus from the tomb and “the dead man came out,” bound with the burial cloths that claimed him for death. “Untie him and let him go,” Jesus says. Those powerful, hopeful words are said to us too. We are called, not to die, but to live. Later, on Calvary Jesus himself becomes our sign. A painful death does not claim him, nor will the grave hold him. He is our hope. I believe you are the Resurrection and the Life. El maravilloso relato de la muerte y resurrección de Lázaro nos ayuda a apreciar el misterio de la muerte y resurrección de Jesús, Lázaro pertenecía a una familia con influencia que le dió la bienvenida a Jesús a su hogar en Betanía, una aldea a unas dos millas de Jerusalén. Marta y María eran sus hermanas. Jesús se quedó con ellos cuando él visitó la Ciudad Sagrada. Cuando Lázaro murió algunos días antes de la Pascua, Jesús había dejado a Jerusalén debido a las amenazas contra su vida, y estaba aguardándose en la seguridad del Transjordán, la región donde Juan el Bautista había bautizado. Notificado de la muerte de su amigo, Jesús retornó a Betanía, despreocupado por sí mismo. Nuestro Evangelio quiere que nosotros comprendamos que la muerte en sus muchas formas era lo que Jesús vino a remover, y que el Lázaro muerto era un signo de lo que Él quiere hacer por toda la humanidad. Lázaro era su amigo, pero Jesús, el Verbo hecho carne, es amigo de toda la raza humana. En la conmovedora conclusión del evangelio de hoy, Jesús llama al difunto Lázaro de la tumba y “el muerto salió” atado con las vendas funerales que lo habían atrapado en la muerte. ” Desátenlo y déjenlo ir,” Jesús dice. Esas poderosas palabras, llenas de esperanza, son dichas para nosotros también. Somos llamados, no a la muerte sino a la vida. Después en el Calvario Jesús mismo se convierte en un signo para nosotros. Esa muerte dolorosa no lo reclama, ni tampoco la tumba lo aguantará. Él es nuestra esperanza. Como Marta la hermana de Lázaro, O Señor, yo creo que tú eres la Resurrección y la Vida. Hadithi nzuri sana kuhusu kifo na kufufuliwa kwa Lazaro inatuonyasha fumbo la kifo na ufufuko wa Yesu Kristu. Lazaro alikuwa katika familia maarufu na ya ushawishi mkubwa sana. Walimkaribisha Yesu nyumbani kwao kule Bethania, kijiji kilicho kuwa umbali wa maili mbili kutoka Yerusalem. Marita Na Maria walikuwa dada zake Lazaro. Yesu alibaki nao alipotembea mji mtakatifu. Lazaro alipokufa siku chache kabla ya karamu ya mwisho, Yesu aliondoka Yerusalem kwa sababu ya vitisho viliyotishia maisha yake. Alibaki kwenye sehem ya amani Transjordan, eneo ambalo Yohana mbatizaji alimbatiza yesu. Baada ya kupata taarifu ya kifo cha rafiki yake, Yesu alirudi Bethania, bila kujali usalama wake. Yesu alikuja kuondoa aina zote za kifo, injili inataka tuelewe kifo cha Lazaro ni alama ambayo Yesu alifanya kwa ajili ya wanadamu wote. Lazaro alikuwa rafiki wa Yesu aliyetwaa ubinadamu wetu. Amekuwa rafiki wa wanadamu wote. Kwa ujumla katika injili ya leo, Yesu anamuita Lazaro aliyekufa kutoka kaburini na “mtu akatoka nje,” akiwa amefungwa sanda za kuzikwa zizoanyesha alikuwa mfu.. “Mfungue na mueche aende” Yesu alisema. Haya maneno yenye nguvu, matumaini yanasikika kwetu pia. Tumeitwa ili tuishi na siyo kufa. Badae katika mlima wa kalvari Yesu mwenyewe alikuwa alama. Kifo na maumivu hakimtangazi Yesu wala kaburi halitamsuia Yesu, ni matumaini yetu. Kwa hayo matumaini yalimuimarisha Mt. Paulo wa Msalaba. “Unaniuuliza ninaendeleaje. Niko mgonjwa kuliko mwenye afya, nimejaa na maradhi. Ni vigumu kuandika haya… lakini naona vizuri kubeba pingu, kamba, ngumi, mijeledi, vidonda, miiba, msalaba na kifo cha mkombozi wangu, nakimbia kwenye kifua cha baba, kwenye undani wa kimungu. This entry was posted in Religion on April 6, 2014 by vhoagland. The lenten readings from John’s gospel for today and the next week of lent (chapters 7-10) describe Jesus‘ activity in Jerusalem during the eight- day Feast of Tabernacles, the popular autumn feast that brought many visitors to the city to celebrate the grape harvest and pray for rain. Water was brought into the temple courtyard from the Pool of Siloam and lighted torches were ablaze during the celebration. Arriving late for the feast, Jesus taught in the temple area and revealed who he was, using the images of water and light. His cure of the blind man, in the 9th chapter of the gospel, is a sign of the light he bestows on a blind world. Yet, some don’t see. Those hearing him are divided; some want him arrested, some believe, some question his Galilean origins and his upbringing as a carpenter’s son. How can he be the Messiah, a teacher in Israel? We’re surprised at unbelief before the Word of God on his way from Nazareth to Jerusalem. Why didn’t all see and believe? People doubted him then, and they will doubt him now. Even his disciples are slow to believe. “How slow you are to believe…”Jesus says to the two on the way to Emmaus. But the Word continues to teach in our world and to instruct disciples weak in faith. His mission is not ended. Saints like Paul of the Cross knew that. However fierce the opposition, the Word of God, Jesus Christ, brings light and life. This entry was posted in Religion and tagged Feast of Tabernacles, Jesus Christ, lenten reflections, man born blind, Passionists, Pool of Siloam, Temple on April 5, 2014 by vhoagland. Different witnesses take the stand in John’s gospel today (John 5,31-47) and we listen to them testify for Jesus. They counter the false witnesses brought forth when Jesus stands before Caiphas, the high priest. These are the ways faith in Jesus comes to us even now. How faithfully do we accept them? The church, like John the Baptist, points Jesus Christ out to us; are we guided by its light? His works and words and miracles are proclaimed in the scriptures; do we search into them? Our heavenly Father draws us to his Son; do we pray for faith and humility to accept his grace? This entry was posted in Religion and tagged Caiphas, false testimony, Jesus Christ, John the Baptist, John's gospel, lenten readings on April 3, 2014 by vhoagland.